Hello! It’s me, Leslie, and I’m excited to be sharing my first post on the Dies R Us Inspiration Blog today! I’ll be with you on Mondays from here on out and I think it’s going to be a lot of fun. Years ago there was a question asked in an online stamping forum: “Are you a ‘stampy stamper’ or a ‘scrappy stamper’?” Well, I had to say I’m definitely a ‘stampy stamper’, meaning my focus is on the stamped image using various means at my disposal to enhance the image. 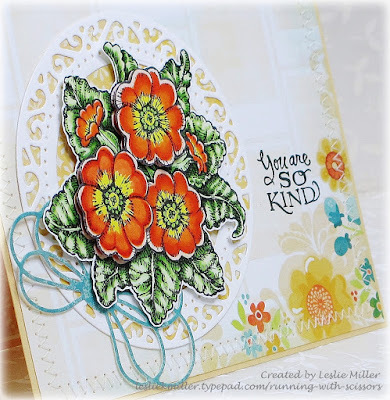 A scrappy stamper is one who makes those marvelously creative cards using very little stamping, but somehow manages to pull all the parts together into a magnificent whole. Isn’t it wonderful that these days we can so easily combine both styles into one card? I hardly ever make a card without die cuts anymore. Sometimes I’ll use just a few, and sometimes I’ll use quite a lot. Today I’m using three die cuts to turn these brightly colored primroses (Power Poppy’s Potted Primroses) into a pretty little nosegay. 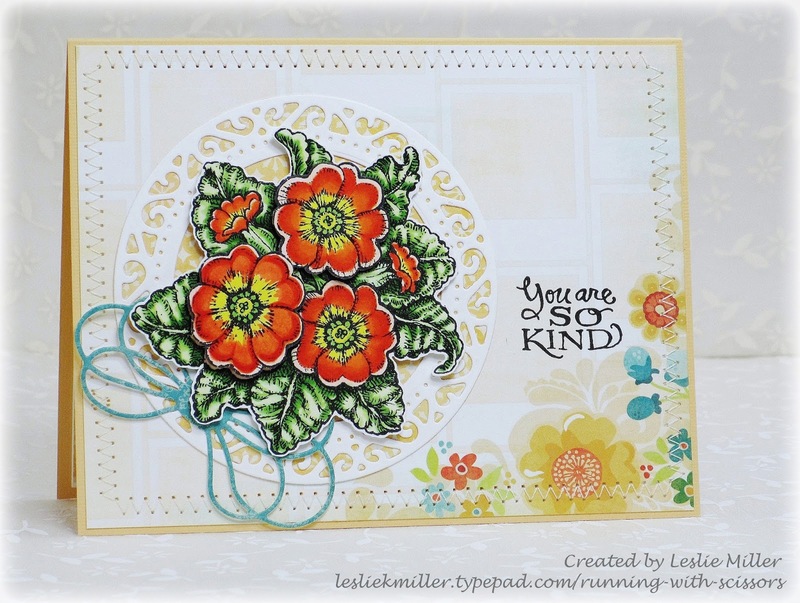 I positioned one of the Sue Wilson Italian Collection Decorative Frames over a Spellbinders Classic Circle which I cut from yellow designer paper, then accented with an Impression Obsession Large Bow (curly tails cut off). I’ll soon be adding more bow dies to my collection from the many available in the Dies R Us store. They’re a fabulous way to add a bow of any color without the bulk of a ribbon knot. I like this one, for instance, but there are many more to see if you simply type “bow” into the search field. That pretty Sue Wilson decorative die cut makes all the difference, doesn’t it? So how about you? Are you a ‘stampy stamper’ or a ‘scrappy stamper’? Thanks for joining me today. Be sure and check back tomorrow and every day for fresh inspiration! Great job Leslie! Awesome inspiration piece! Welcome to the team! An absolutely gorgeous card! Welcome aboard! !